Students are challenged to write about their field trip to “The Rink” using all seven types of sentence variety, all of the five senses, and to use at least one simile. We’re going to the skating rink! Exitedly, we skated and ate for two hours. I tried the cotton candy and the icy, the cotton cand tasted very sweet and felt as soft as a pillow ull of cottons and the icy made me felt like my head was covered with snow. Wearing the skates were slippery. I fell a couple times and it really hurts. At the skating rink, most people were good at skating and some were ok but saw some people that hand on to the wall the whole time. On the bus me and my friends said,”Skating was fun!” To get to spent time with my friends on the field trip made me feel happy. Did you have at the skating rink? “The Rink” was awesome! On June 20th, some of us were in the EGUSD van to “The Rink”. Along the way we saw Safety Ville, stores, and many houses. Finally, the car stopped. Walking, we were all in line to be stamped. When we went in we heard music and not a lot of screaming. To come to “The Rink” was exciting. Now, should I start skating or eat? Skating for about 25 minutes I saw my classmate and the both of us crashed! “Ahhh!” I squealed. When we got up we apologized and continued on skating. When they began the skating game I went to eat nachos. It smelled of cheese with salt and pepper. As I picked up the chip I felt the sticky chees ooze down my fingers. I ate half of my nacho and drank soda because the cheese was a little spicy. “The Rink” was now as loud as a concert since we came. Sadly, it was time to go. In, the bus we were going to The Rink. “Come on Karen” I said while I stared to skate. To be there was very fun because we were eating pizza and drinking sodas and icees. 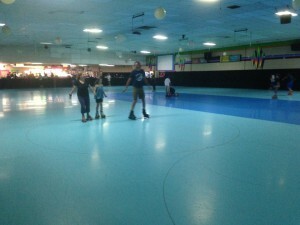 Whenwe got into the roller rink it smelled like puke and it was just like superly disgusting. Usually I heard screaming it sounded like this ahh! because like alot of people kept falling. “are you ok Karen?” I asked because she had fell. When I saw people falling it created a rucus . I could actually fell the wind blowing on my cheeks wich was really weird. Going on the feild trip was like going to Disneyland but way more fun because I was with my best freinds Karen,Christopher,Vivian,and Gur. I had so much fun that me and my freinds might go together again sometime soon. We were going to The Rink in the bus. Our roller skating field trip was fantastic!As we entered in, the cold air inside the building splashed onto my skin.Quickly, we lined up in front of the counter to get our roller skates.In front of the counter, groups of kids were piled there waiting.Falling and stumbling, I sat on a bench and put on my roller skating shoes. The shoes felt as if I was carrying seven textbooks in my hands.While I skated on the rink, I fell on the ground a couple of times but it didn’t hurt.I saw fifth graders skating on the rink while colorful lights danced on the walls and floor.We could hear musics coming from the speakers.To see the colorful lights I felt amazed. “Hey Marlyna lets go get some Icees”, I said. Once my hands touched the cup, my hands felt as cold as ice. “Ahhh! This is cold”, I thought.As I drinked my beverage, I could smell the pizzas cooked pizzas in the oven.It felt only like a few minutes but it was time to leave.But at least we were able to skate and have fun. Wouldn’t you want to go roller skating too?Our field trip to The Rink, was amazing! Going,on my field trip to the roller skating rink was awesome. My favorite moment was when we played red light green light. To play red light green light made me happy to cheer on my friends. On the skating rink floor we heard people yelling as they fell on the floor. Happily,I saw many things that lit up. I tripped and it felt like someone threw a rock at my leg when I landed on the floor! We bought some food and the music was so loud that I could barely hear the women at the counter. She said “what would you like?”After I bought my food I ate it,it smelled really good and tasted amazing. My field trip to the skating rink was great. Going to the skating rink was as fun as going to Six flags. At the skating rink I tasted food. To taste the pizza made my stomach feel good. Excitingly, skating with my friends was fun. My friends and I were skating together. Did you skate with your friends. While leaving I said to my friends ” Don’t you want to come go to the rink again!”. Six flags was just as fun as the skating rink. Going on a field trip to the rollar skateing rink was was fun. The taste of my nochos was spicy. The smell of my icy was refreshing. To skate with my friends made me feel excited. At the rink I skated for a long time. The sight of the rink made my heart skip a beat. Quickly I skated with my friends. Hearing people have fun made me smile. Skateing was as fun as a carnival. As I fell I felt the slipery floor. While I was skateing, in my head I screamed “Don’t fall!” Every time I fell I would say to myself “I wonder if I will fall again?” Skateing was awsome, I’m glad we went for our field trip. Our field trip to the rink was fun. Also it was hard because I did’nt know how to skate. The icee there where as cold as the north pole. Suprizingly, there was alot of kids there. I felt the icee making my hands cold. Then I smelled the pizza from the snack bar. I also saw alot of kids falling and some where skating perfect. I also heard the songs they played there. I touched the grease pizza. When we bought the whole pizza my friends said ”ooo the pizza is here”! And also I was asking people are they ok when they fell? Going back to school was not fun because all the fun times are gone. Skating is a fun thing to do even though some things may occur. In the skating ring for like ten minutes I had to chase Pedro to get the money that i accidentally gave him! Also I only fell once because of him going in front of me. To fall in the skating ring felt as pain full as breaking a leg. Skating wasn’t that bad when I got done chasing him. Surprisingly my favorite song Fancy by Iggy came on. Did you or your class ever get a chance to go on a roller skating field trip? Eating the food all that I can taste was the cheese melted on the bread but in the middle of a bit a kid yelled “YOLO.” A couple seconds later I smelt a nasty Oder and i said “eww.” Having 40 minutes left I just had fun. In conclusion I did not mind having to chase someone, someone yelling at me, or falling because in the end I had fun. Having a field trip to the roller rink was awesome. When we where driving to the roller rink, all I heard was the other students talk and talk. Getting my scatting shoes was like a zombie place to get brains, because when everyone was getting there skates to, everyone was crumbed up like if where making a cookie out of people. Slowly, when I was grabbing on the wall I felt like falling on my bones and possibly break a bone or something. While I was drinking soda I realized the taste was coca cola, and all I was seeing was kids fall like nothing. Touching or holding the gun from terminator was awesome because me and Alvin (one of my friends) where playing together. having skates on all the time was like using a skate board. When Alvin asked me “ho are you going to couple skate with?” and then I told him”no one why?” and then he said “ok”. All I really smelled was the pizza, hot dogs, nachos, and ice cream. To go to the rink was the most awesome field trip every. To wait in the bus for our field trip which is skating was worth waiting for. Once I got there I saw the food area I smelled food but manly pizza. But of course I bought so food which is ice cream and pizza. Once I saw the ice cream my mouth felt like a puddle of water. Wondering to mself,” should I buy the roller blades?” Then I decide to buy it and it made skating easier for me.”yay!,”I screamed because one of the games just started which is red light green light. Sadly 30 minnites later I hear,” this is the last song you guys are going to hear today.” Atthe field trip I had so much fun. Still thinking waiting in the bus was worth it for our field trip. I enjoyed going to the roller rink. Being at the roller rink was fun because I get to hang out with my friends. WhenI was skating for the first time. I couldn’t go that fast. The rink was big as a school. I had to hold on the thing that helps you on the side of the rink. In the front where the food is at. I bought there nachos that was hot but taste really good and smells like cheese. Also, there was a man that was playing music out loud while every one was skating. To take off the skates made my feet sore. Happily every one had fun. skating was really fun. Will you try it one day. Going to the skating rink feild trip felt amazing. I saw Mr. Alfonso help Tariya skate At the snack bar there were lots of people in line. Camily, I entered the rink to skate. My freind asked me ” Where did you buy glow in the dark sunglass?” I said ” At that store.” Thankyou for showing me.” Falling down on the rink felt hard as a rock. I fell like ten times! We’re going to the skating rink! Exitedly, we skated and ate for two hours. I tried the cotton candy and the icy, the cotton cand tasted very sweet and felt as soft as a pillow full of cottons and the icy made me felt like my head was covered with snow. Wearing the skates were slippery. I fell a couple times and it really hurts. At the skating rink, most people were good at skating and some were ok but saw some people that hand on to the wall the whole time. On the bus me and my friends said,”Skating was fun!” To get to spent time with my friends on the field trip made me feel happy. Did you have fun at the skating rink? Going to the skating rink feild trip felt amazing. I saw Mr. Alfonso help Tariya skate At the snack bar there were lots of people in line. Camily, I entered the rink to skate. My freind asked me ” Where did you buy glow in the dark sunglass?” I said ” At that store.” Thankyou for showing me.” Falling down on the rink felt hard as a rock. I fell like ten times! To pick up the nochos were felt hot. The nochos were very chessey and it tasted delishes, also it smelled good. When I touched the cotten candy it felt sticky. I heared very good songs when I was skateing. The feild trip was amazing. Going to the field trip was fantastic. I fell a few times but it didn’t really hurt. I was skating. Happily I was skating without falling. To skate was as fun as going to Six Flags. The nachos smelled really good and tasted really good. I bought an ice-cream and picked it up and tasted it. “It was really good”. I saw many people roller skating. Alot of people were skating and holding on to the edge. I heard so many people singing at the skating rink. To go to the field trip was amazing. My field trip was the awsomest time ever! So when the bus driver was finished asking the rules in the bus we went to the rink. So when we got there I got exited to skate eat and have fun over at the rink. So I was so exited to skate too! I asked for size 4 or 5. When I was skating I kept falling on my hands well it didnt hurt. So then I decided to take a break from skating so I asked hernan to buy us some slushies to get energy. So I was hungy also. So I asked hernan to buy us nachos when I smelled the cheese It smelled really good and we shared the nachos. Then after drinking and eating nachos and slushies and went skating I was hearing music through my ears it was loud that I should cover my ears while the music is so loud and took a rest again to drink our slushies hernan sucked the whole thing like eating a nacho very quick! when it was 11:30 already we left the rink. That was the most awsome field trip ever! Were going to the skating rink! Renting skates is fun. Happily, I got a Rockstar from the vending machine it was cold as the world Narnia. In the van me and Aj said “skating is fun”. To spend time with my friends made me feel happy. Smelling the odor of buried rubber is bad. Feeling the laces on my skates they were ruff. Will you go skating? At the field trip it was cool. The place was called the Rink. I fell a couple times. There were children screaming and laughing. Some kids and adults bought food there. It smelled like pizza and cheese. I saw peaple fall down and peaple helping others. I heard games and music. My favorite song was the nae nae,problem,and fancy.Loudly, peaple were screaming and laughing. seeing myself skate was amaziing for me. Some peaple made me fall down. I asked peaple “do you now how to skate”? My time at the rink was fun. The ”Rink” was great,I had lots of fun. Quickly,we loaded on to the skating rink. On the rink, I saw students slip and fall left and right. To skate made my legs feel wobbly like jello. Freezing in my mouth,my icee tasted delicious. ”Brain freeze” I heard myself whisper as I shuddered. The cheesy scent of nachos and pizza was almost unbearable. Moving to swiftly, I almost crashed! Have you ever went roller skating? How was it? My roller skating field trip was awsome because I was roller skating also I fell lots of times my time was impresive but I fell on my but lots of times because I wasin’t looking forward where I was whaching my dad because he was about to leave because he had to go to work. Also they had to pick up my sister because she stayed at my cousins howse. Even if they leave I wonder where they go. Also then when I was roller skating I only roller skate when it is free time I don’t skate when it’s onother thing. Even I bot a ICE and nachos I felt them they felt smooth I tasted them they where crunchy. Even when they had the chese. Also they have games and that didin’t play anything I just skated because it was fun because I got the hang of it and I’m faster and stedeyer and I should my dad that I’m geting the hang of it and it was hard at first because I didin’t go roller skating for one year I was a little rusty and the fieldtrip was fun. 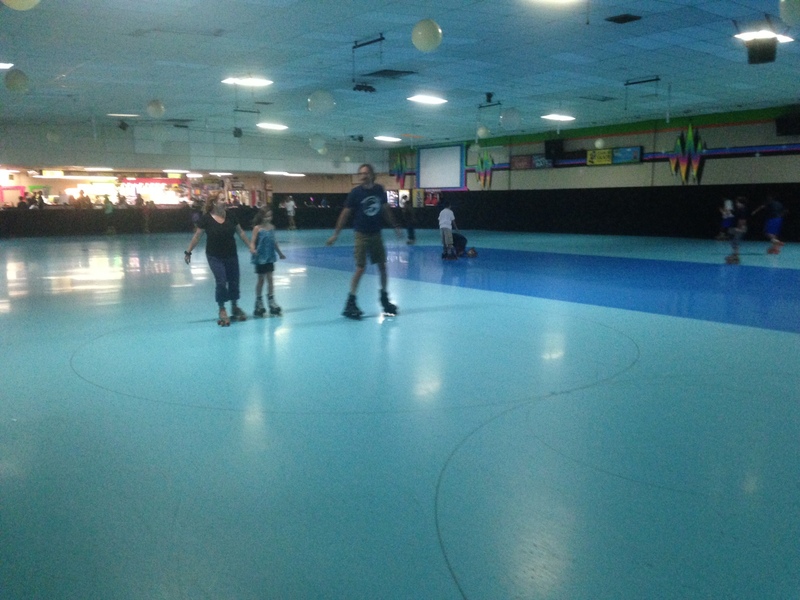 Going to the roller skating rink was an awesome experience. There are many reasons why it was an awesome filed trip. While i was in the bus, i played i my i-pod. To play my i-pod was fun and something that will be a useful thing to relieve boredness. But once we arrived at the rink, when i entered it smelled like puke. It smelled as bad as a public restroom. I saw a candy machine when i entered and i went to go buy some candy and it was some very good candy for my belly! I went to go find Donovan to give him some candy. Once he ate the chewy ring pops, he said,” Hmmmm these candies are good!” Happily, i was skating around the rink with Alvin to see who is faster. At the rink, people just started going crazy after a while. Did you have fun at the rink, who did you skate with? Going on my fild trip was awsome. After we got ther I hered up to rent my rolre skats.Happly I went in the roler ring.As I skated akros the flore .I feled my legg hit the grouned. I herd my skats clank ugensed the gruond. Ialso herd some one say roler skating is cool!To tast the nochose and icey feled so refreshing. When I got out of the ring I went with my frends to take pekchers of are selvs. We also went to buy light up toy’s. I hope I get to do that agin . have you had fun at a rollre skating ring befor and will you ? On Firday we went skating and had so much fun. When they played the Fancy song then everybody stared to dance Then they play red,yellow,and green light.Then we played some games and ate. I ate a pizza and a soda.Also we had so much fun. Last but not Lest we went on the bus. Then we head back to school. Then at school we whatched a moive and eating lunch. Then we went to have recess. We went to the classroom.Then we clean the room. Then we went to the gate and went home.